I remember back in 2007-ish I wore a crop top out one night with some friends and one of the guys asked me if I got my shirt from Baby Gap. Back then I felt like the way I dressed was a little different than the people I was around. So when he asked me this I felt embarrassed and yes- later shed a few tears. When you're younger, feeling different or the outsider isn't ideal. The main reason I got into blogging is because I wanted to be a part of a community of like-minded people who loved fashion and all that goes along with it. So here we are. Me and my beloved crop tops still going strong. A testament to our true love. I fell in love with this mustard colored dream the minute I set eyes on it. It's by one of my favorite lines Again Collection. I even got to do a fun little interview with them talking about how I celebrate the holidays and why you probably won't catch me on New Year's wearing sequins. Check out the fun here! And remember- Viva la crop tops! 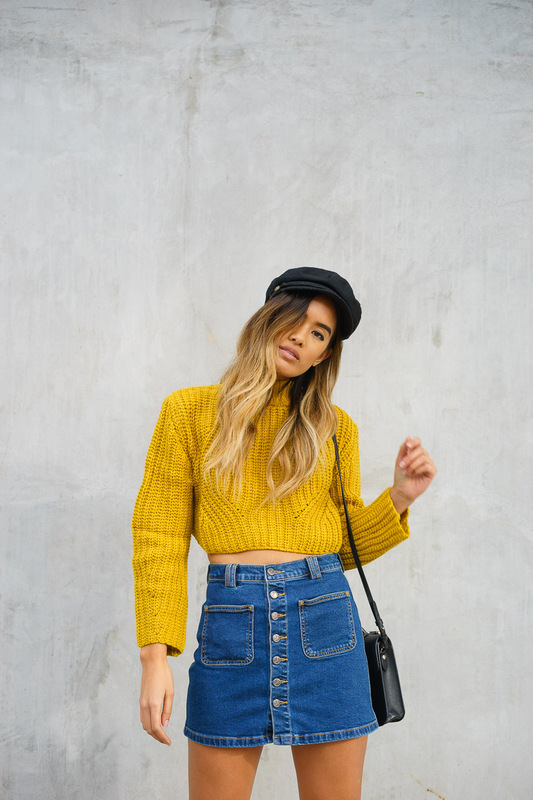 Love the denim button up skirt with the mustard yellow sweater! The boots and the accessories are fab too! Love how 70s you look! Thanks chica! Can't get enough of them 70's viiiiiibes. You me and Thania should hang while you're in LA!! I love how you styled the crop although I wish we had a bit more sun here in the UK so I could wear something similar haha. I have quite a few crops (the cutest crop Xmas jumper) and I can't get enough! yesss! 70s vibe for the win! 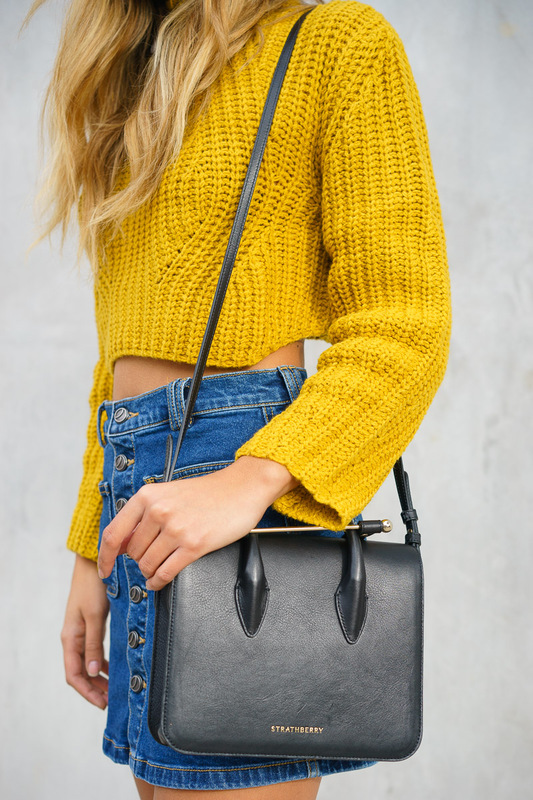 loving that yellow shade! That moustard sweater is absolutely perfect, I've been wanting one like that for god knows how long! And I'm actually about to buy a denim button up skirt because they are the cutest clothing item ever! Love your style so much <3 Also, could you tell me which camera and lense do you use? The quality seems lovely and I love the size of the pictures!